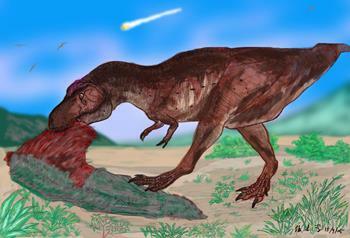 The findings provide a revolution in the understanding of dinosaur evolution. Palaeontologists previously thought that dinosaurs were flourishing right up until they were wiped out by a massive meteorite impact 66 million years ago. By using a sophisticated statistical analysis in conjunction with information from the fossil record, researchers at the Universities of Reading and Bristol showed that dinosaur species were going extinct at a faster pace than new ones were emerging from 50 million years before the meteorite hit. The analyses demonstrate that while the decline in species numbers over time was effectively ubiquitous among all dinosaur groups, their patterns of species loss were different. For instance, the long-necked giant sauropod dinosaurs were in the fastest decline, whereas theropods, the group of dinosaurs that include the iconic Tyrannosaurus rex, were in a more gradual decline. Dr Manabu Sakamoto, University of Reading, the palaeontologist who led the research, said: "We were not expecting this result. While the asteroid impact is still the prime candidate for the dinosaurs' final disappearance, it is clear that they were already past their prime in an evolutionary sense." "Our work is ground-breaking in that, once again, it will change our understanding of the fate of these mighty creatures. While a sudden apocalypse may have been the final nail in the coffin, something else had already been preventing dinosaurs from evolving new species as fast as old species were dying out. "This suggests that for tens of millions of years before their ultimate demise, dinosaurs were beginning to lose their edge as the dominant species on Earth." Professor Mike Benton of the University of Bristol, one of the co-authors of the research, said: "All the evidence shows that the dinosaurs, which had already been around, dominating terrestrial ecosystems for 150 million years, somehow lost the ability to speciate fast enough. This was likely to have contributed to their inability to recover from the environmental crisis caused by the impact." It is thought that a giant asteroid's impact with Earth 66 million years ago threw up millions of tonnes of dust, blacking out the sun, causing short-term global cooling and widespread loss of vegetation. This ecological disaster meant that large animals reliant on the abundance of plants died out, along with the predators that fed on them. The new research suggests that other factors, such as the break-up of continental land masses, sustained volcanic activity and other ecological factors, may possibly have influenced the gradual decline of dinosaurs. This observed decline in dinosaurs would have had implications for other groups of species. Dr Chris Venditti, an evolutionary biologist from the University of Reading and co-author of paper said: "The decline of the dinosaurs would have left plenty of room for mammals, the group of species which humans are a member of, to flourish before the impact, priming them to replace dinosaurs as the dominant animals on earth." Dr Sakamoto points out that the study might provide insight into future biodiversity loss. He said: "Our study strongly indicates that if a group of animals is experiencing a fast pace of extinction more so than they can replace, then they are prone to annihilation once a major catastrophe occurs. This has huge implications for our current and future biodiversity, given the unprecedented speed at which species are going extinct owing to the ongoing human-caused climate change." The new study is published in the journal Proceedings of the National Academy of Sciences (PNAS) and the work was funded by the Leverhulme Trust and The Natural Environment Research Council (NERC).